"Mexican Mondays" have become sort of a thing in our household. Since a majority of Mexican dishes are simple to make and use basic ingredients, it's nice to start out the week with something easy yet deliciously satisfying. Usually some sort of taco is involved, but this past week I decided to switch it up and use tostada shells for a different presentation. I have never cooked with nor eaten a meal containing a tostada, so I had a blank canvas to work with. 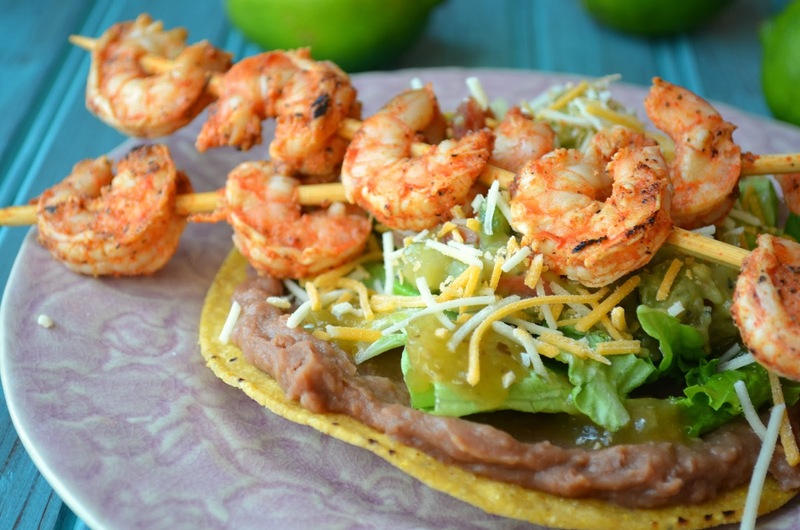 I adapted the marinade for the shrimp from my Shrimp Quesadillas, and then stacked on whatever else I would normally pile into a quesadilla or taco shell. Refried beans, lettuce, salsa, cheese, guacamole. There was no holding back here. The result was a fun-looking stack that was filled with layers of contrasting flavors and textures. This would be a fun one for the kids to create for themselves as well. Enjoy! Combine garlic powder, cayenne pepper, paprika, salt, pepper and lime juice in a bowl. Add shrimp and stir to coat. Allow to sit for 10 minutes. Add 5 shrimp per skewer (presoak the skewers for 30 minutes if using an outdoor grill). Spray a grill pan with cooking spray and heat to medium. Add shrimp skewers in an even layer so they are not touching. Cook 2-3 minutes per side, or until shrimp are pink. Remove from grill and set aside. Heat refried beans in a medium pan. 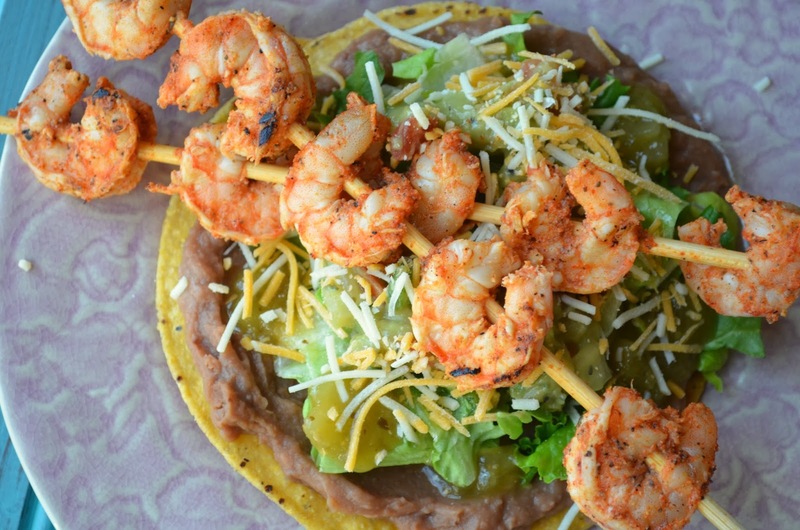 Spread a thin layer of refried beans over each tostada shell. Add a layer of lettuce and top with a spoonful of salsa verde and guacamole. Sprinkle with cheese. 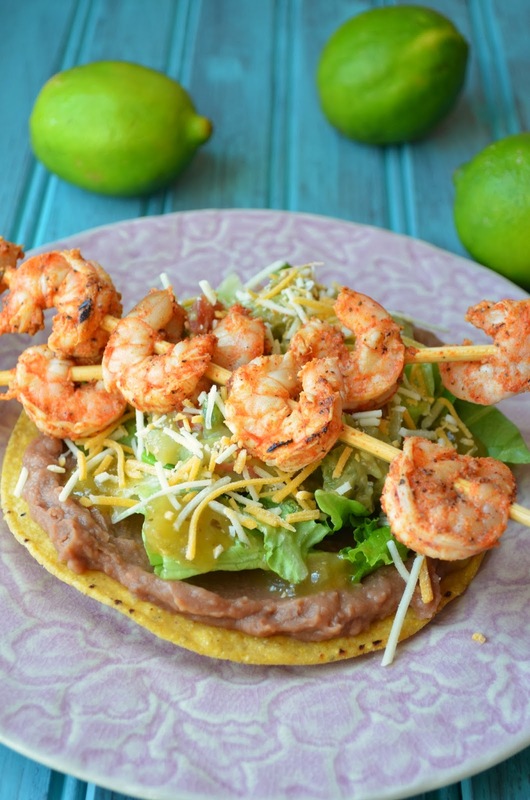 Lay two shrimp skewers on top of each tostada.